Get your BLING on and join us this Mother’s Day weekend for a one of a kind bingo game. Come out for your chance to win some glamorous Park Lane jewelry - sets valued at $100 or more. And ladies, bring your fellas to enjoy the brewery and atmosphere. Kids welcome, too! Pre-Event Special Pricing - RSVP on Facebook or email Katie at team@befierce.org before May 10. Door prize drawings and a 50/50 raffle also planned! This spring we have some great events planned, starting with a Usborne Book Drive, hosted by Be Fierce board member, Devan A Bonahoom. Any books you purchase will contribute toward Be Fierce earning FREE Usborne books to give away to kiddos at Methodist Children’s Hospital at their “Holiday in the Sun” event in July in San Antonio. Please join us from the comfort of your own home via FaceBook on March 3 at 7 pm CST. Usborne publishes awesome books that are kid approved! It's a quick hour where we learn about the books and there will be prize giveaways too! With Easter around the corner it’s a great time to stock up on Easter basket fillers! If you can’t make it during the event time, you can always RSVP via FaceBook as “maybe” and can catch up on the page the next day! Are you looking for ways to give back this holiday season? Help deliver cheer to kids in the hospital by contributing to Be Fierce's 2nd Annual Toy Drive! Drive is open through December 10, 2018. To give, check out the Amazon Wishlists for both San Antonio and St. Petersburg. Gifts will be delivered in December to Methodist Children's in San Antonio and All Children's in St. Petersburg. Thank you - your gift will will help bring a smile to kid in need this holiday season! And a big thank you to all of those who have already contributed at the kick off on Nov. 10 at Devan and Sam’s Deck the Halls party! Join us for a care pack party! Care packages help bring a smile to a child’s face during a tough hospital stay – and we need your help to spread the joy! On Sept. 8, join us to put together care packs for the children’s hospitals in St. Pete and San Antonio, and for just $20 you can sponsor a care pack of your own! Donate today at www.befierce.org. 100s of packs, 2 cities, 1 great cause! Refreshments, food, and fun will be served! 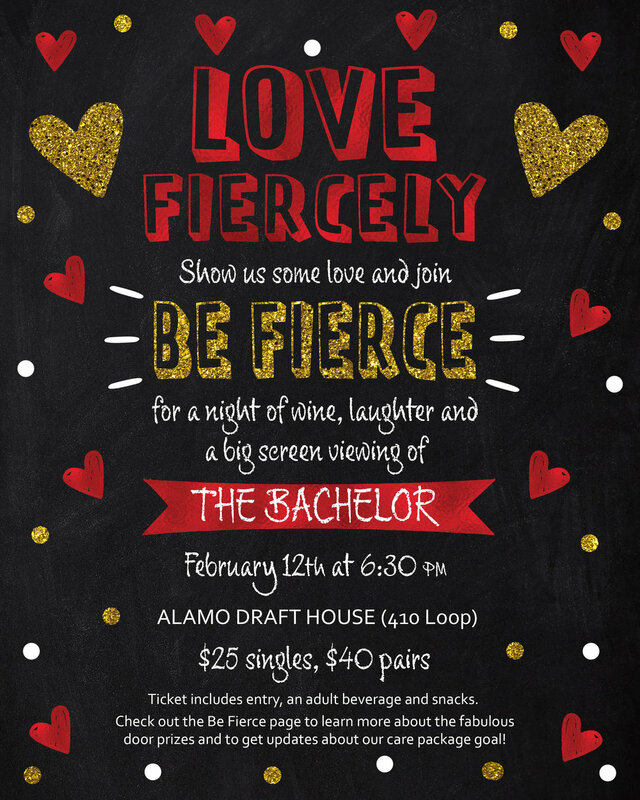 Join Be Fierce for a Care Pack Party! Sweet treats and fun on the menu! No one wants to spend time in the hospital - that's especially true during the holidays. Please help us to bring cheer to kids who will be spending time in the hospital over the holiday season by supporting our first annual Holiday Toy Drive. We've started our own "good list" to make it easy for you to select a toy. Check out our Amazon Wish List below, which will deliver your generous contribution to Devan and Sam's home. Your gift will be placed in safe keeping under the tree until we deliver it to Methodist Children's Hospital in early December. Thank you for bringing cheer this holiday season to FIERCE kids in San Antonio! The Be Fierce Foundation is a nonprofit 501(c)3 created in 2017 to serve as an advocate for kids and their families that are fighting rare and undiagnosed diseases.